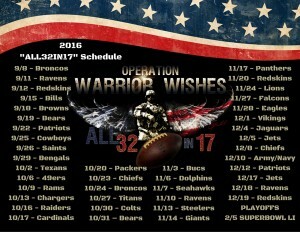 This is going to be a wild weekend filled with Warrior Wishes coming true! Thanks to many generous supporters, we have been receiving more and more donations as our mission continues to grow. Those donations include cash, meals, tickets and volunteered time. 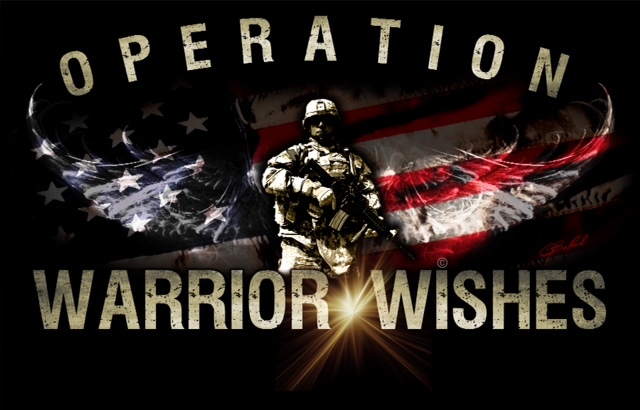 We are very thankful to everyone for their support & proud to say that 98% of what we bring in goes directly towards making wishes come true for our nation’s heroes. 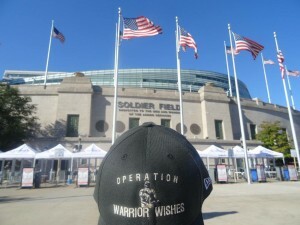 This weekend some generous donors helped us treat some amazing Warriors to some unforgettable experiences! Last night our friends at VACO in Nashville made Warrior Wishes come true in a “Suite” way at the Predators game for the 3rd straight year! 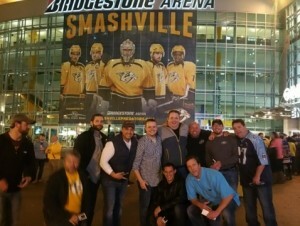 Thankfully, Warrior Wishes Director Mark Toppel, was able to host the large group of warriors along with our friend Keith in Nashville. My dad would have been there, but he was headed to the east coast for the weekend to host Warriors at the Ravens game on Sunday & Giants game Monday night. While he was on the road, we also had the opportunity to make a few wishes come true back here in Chicago thanks to Vern Tempe. Vern donated 4 Packers vs. Bears 4th row tickets! With -20 degree wind chills in the forecast we thought it may be tough to find Warriors who would want to attend the game. 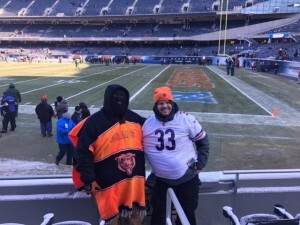 But warriors don’t care how cold it is, they are tough, so of course we found a few brave Warriors who were willing to “bear” the cold weather to see their team take on the division rival Green Bay Packers. It was an honor to host Army Sgt William Cree & the Gold Star family of Army SGT Damian Bushart at the game. My dad and I had met SGT Cree & his service dog Nixon the NFL Draft in Chicago. William mentioned he was a Bears fan. His Friend nominated him for the experience. 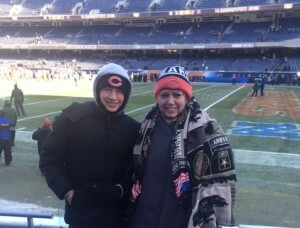 He was beyond excited to watch the Bears from the 4th row! Army Sgt Damian Bushart made the Ultimate sacrifice while serving our country in Iraq in 2003. It was a true honor to provide this experience to SGT Bushart’s wife & son in his honor. As you can see, everyone was dressed for the extreme weather conditions. Thankfully temperatures never dropped as low as they were expected to go, but it was still in the single digits all game long. The Bears did their best to play spoiler & tried to crush the Packers hopes of making the playoffs. Unfortunately, Aaron Rodgers & the Packers did what they do best & were able to beat the Bears 30-27 and keep their playoff chances alive. 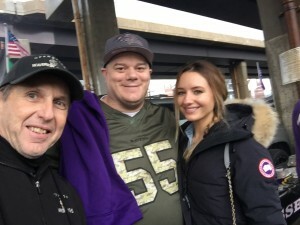 Despite the loss, everyone still had a great time & nobody got frostbite! Haha. 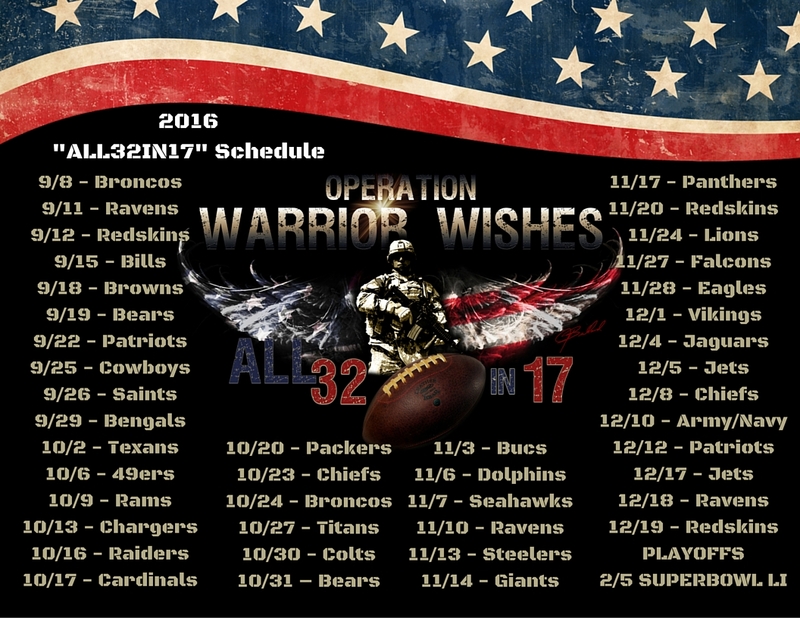 Operation Warrior Wishes would like to thank Vern Tempe for donating the incredible 4th row seats to make these wishes come true. But MOST importantly we want to thank Sgt Cree and to the Bushart family for their service and ultimate sacrifice for our freedoms. It is appreciated, it has not gone unnoticed & will never be forgotten. My name is William Cree I join the Marine Corps at the age of 18 straight out of high school I was shipped off to boot camp the day after my 18th birthday on July 7 I went to basic training then chose to be come motor tea went to motor transport school and completed it after that I was shipped off to camp Penelton California within two weeks I was shipped off to Iraq for my first tour to Iraq. I did two more tours on my third tour I reenlisted I enjoyed being a leader of Marines and teaching them what I knew and what I’ve been taught. About a year after I reenlisted I was in a severe motorcycle accident and paralyzed my arm because I paralyzed my arm I was no longer able to stay in active duty so I was medically separated from the Marines. 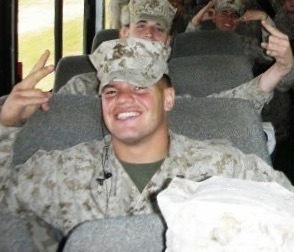 PFC Damian Scott Bushart was born May 27,1981. He was a native of Waterford, Michigan and was the older of two sons born to John (Skip) Bushart and Patricia McLatcher. Damian is survived by his younger brother Eric who resides in Waterford and his son, Joshua Henry Arthur Bushart who lives in Mattoon, Illinois with his mother Toni Jo Lampe. Damian graduated from Waterford’s Our Lady of the Lakes High School in 1999. He was a member of both the football team and the track squad. During this time Damian also studied martial arts, earning a brown belt with two stripes (just one step down from a black belt) in Tang Soo Do Karate and a yellow belt with strip in Jujitsu. Traveling the tournament circuit, he won many trophies for both forms and fighting. It was during his teen years that Damian had his first taste of military life when he joined the Civil Air Patrol (CAP), a civilian auxiliary of the U.S. Air Force. As a CAP cadet he held numerous leadership positions including Ground Search Team Leader, Cadet First Sergeant, and serverd as a member of the unit’s Color Guard. He excelled in land navigation and survival skills. Through Civil Air Patrol, Damian applied for and was accepted to attend the USAF Pararescue Orientation and Mountaineering Course of the U.S. Air Force Pararescue School. Upon completion of these courses, Damian was given an Air Force Pararescue badge, which remained one of his prize possessions. In January of 2003, Damian was assigned to A Troop, 1st Squadron, 1st Calvary Regiment, 1st Armor Division at the Armstrong Barracks in Wiesbaden, Germany. In April the unit deployed to Kuwait and then to Baghdad, Iraq to join Operation Iraqi Freedom. 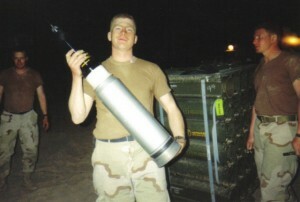 While in Baghdad, Damian wrote home that Americans don’t appreciate what they have. He saw children digging through garbage looking for food to eat and saw areas that were worse than any ghetto in the U.S. He felt his mission of bringing freedom to these people was meaningful and just. Although he did not return from his mission, we are assured that Damian loved his country. According to his First Sergeant, Damian gave 110 percent to being a soldier and moral within his team. His dedication, perseverance and commitment to his duty as a soldier resulted in his paying the ultimate price, the loss of his life. 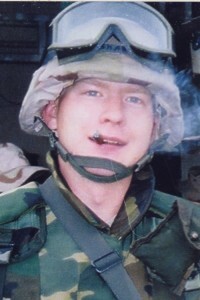 On November 22, 2003, PFC Damian Scott Bushart was killed during Operation Iraqi Freedom. Gone, but Never Forgotten!